And maybe you’re in the same boat. Maybe all those tips and trick on organizing your blog absolutely don’t apply to you. Or you start them but can’t keep up with them. Maybe this is your inner blogging guru trying to tell you something. Well here’s what mine is telling me. Why do I sometimes feel like the internet is this huge conglomerate of digital voices telling me what I’m doing wrong? Why do I want to slam my laptop shut and never read another post about how to be better at Pinterest, blogging, Instagram, etc? I continue to do nothing and accidentally stumble upon a cool website called Message to The Universe, where people send messages to the universe via computer, and it lists them all in a feed for the world to see, anonymously. Wow this is so cool! Reading these messages make me feel like God. I feel like I’m listening to other people’s prayers and I want to cry because some people are hurting SO much. I state these two examples to show you how my blog posts form because of a feeling. First I start with nothing, then I move into a feeling. Some are good, some are bad, but both can warrant a blog post. (Blogging is like drinking–you do it in good times and bad). I write these feelings down in Evernote. Just a couple of sentences.Whatever I’m feeling in the moment about that particular topic. It has to get off my chest at some point. It has to be shared with the world. It has to give other people feeling. Then I wait about 7 hours after I write these down, because I’m usually not in a position to start a blog post when I’m doing nothing. (Especially when I’m doing nothing. AKA perusing the internet). And then sometimes I’m actually doing something, and I have zero time to begin anything. Point being, these sentences get left alone to stew in Evernote and my subconscious for about 7-8 hours. Then when I have time, I come back to those feelings I wrote down about certain things and review them. 90% of the time I don’t want to write about them anymore because those ideas were written in the moment, and now I’m in a different moment and I may not feel the same way about them. So I don’t write a blog post at all. Even when I’m ready. So I move on to something else. I’ll be on the web experimenting with a social strategy for my blog, organizing some social shares on Buffer, and commenting on other blog posts. This is where my sub-conscious toils and toils again over the things I’ve written down in my blog post ideas section. I get the itch to write. Something on the internet reminds me of why I hated the internet so much that one morning and just like that, I’m back in WordPress, typing up a draft. I told you this was disorganized. And when it’s all spewed and messy, after writing and writing without thinking, I look at everything I wrote and start to make it shine. I start discarding words and adding commas, chopping and mashing until it all looks coherent and flows nicely. And then I quickly find a picture from Morgue File, edit it in Pic Monkey, and share it with the semi-world. So in review, if you look at this as a whole, my method for coming up with blog post ideas consists of two things: time and feeling. I feel things, I give them time, I feel things again, and then the posts form. But this whole ‘nothing’ part is crucial too. The best stuff arrives in your brain inbox when you’re not thinking about anything in particular. It’s because our sub-conscious is freaking sneaky. It works when we’re working, and it arrives at a conclusion while we’re still working. And because I’m such a “I have to do this right now” type of writer, I’ll be working on something else and have to stop and open up some document and just write write write while it’s all coming out, without regard for form, keywords, SEO, catchy headlines, etc. Like right now as I’m writing this. And then when I come back to it later (again), I’ll edit. Cause that doesn’t require any thought really. It just requires putting yourself in the reader’s perspective and seeing what makes sense. That’s almost like the lazy part. It only requires a keen ear for what sounds good. Or a keen eye for what reads good. I realize this is a rather weird, unique process that won’t work for everyone. But the point of sharing this with you is so you don’t worry too much about process in your blog writing. The creative mind is messy and free, so let it be, don’t try and strap it down. What about you? 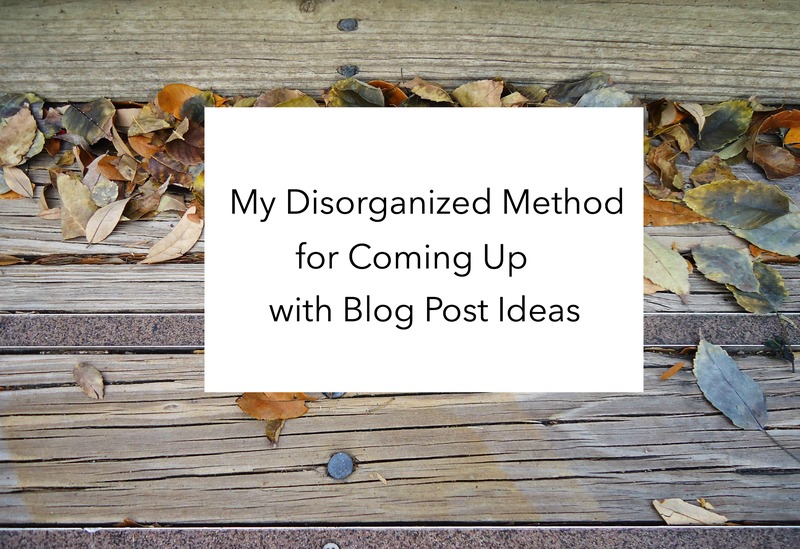 Is your method for coming up with blog posts highly organized or disorganized? You publish stuff all the time, so your method must be working for you! Aw, thanks Khaula! It’s a pleasure to meet you! Thanks for stopping by! YES, we have to be soul sisters! I can’t pre-plan posts because I don’t know how I will feel. I totally have to be feeling them to even hit publish! Exactly! Because if you aren’t feeling it, then it ain’t right. That’s my trouble with trying to plan posts out. The most I”ll do is maybe write them out as I feel them, then schedule them in. But it’s hard to just say you’re going to write about something on a particular day. So great to meet you via SITS! I tend to write the first 3 sentences of 20 blog posts before I get a full one out. I just have to feel like writing about it. Exactly Laina! There is no organized way to really do this I feel haha. I have oh so many drafts! Thanks for stopping by! The fact that you can put your process into words, already makes your method way more organized than mines. I have like a running title generator in my head, and that’s usually how the rest of the post comes along. Oh, by the way I am forever in your debt for introducing me to MorgueFile! Happy SITS Day!! I’m kind of the same way, the ideas just come at random times and I jot them down for later writing when the mood strikes.